Investors are “beginning to question” Xiaomi’s $46B valuation after the company reportedly failed to hit its sales target of 80M smartphones in 2015, reports the WSJ. That target was itself reduced from 100M last summer, and the company has also not yet delivered on its promise of substantial revenue from Internet services. Xiaomi has faced tougher competition from more established brands like Huawei. Huawei’s engineering strength and brand image, built up over decades, make it difficult for Xiaomi to compete in China, analysts say. “The competition in China’s smartphone market has intensified tremendously this year,” said a Xiaomi spokeswoman, who declined to comment on the company’s valuation or say whether it met its 2015 sales target. Two separate market share reports show that Samsung, Lenovo/Motorola and Xiaomi all lost out in global smartphone market share year-on-year, while Apple and Huawei made gains. Huawei yesterday reported that it was on track to ship 100 million phones this year. New data from Gartner suggests that Samsung saw its worldwide sales fall by 5.3% year-on-year, its market share dropping from 26.2% in Q2 2014 to 21.9% in the same quarter this year. The company lost ground to both Apple and Chinese brands Huawei and Xiaomi. Despite the launch of new S6 models, Samsung’s premium phones continued to be challenged by Apple’s large-screen iPhones. Samsung lost 4.3 percentage points in market share and declined 5.3 percent in unit sales in the second quarter of 2015. In a move that’s no surprise to anyone who’s been following HTC news recently, the company just announced that it’s going to cut 15% of its workforce. Some 2,250 people will lose their jobs as part of the company’s aim to cut 35% of its expenses before 2016 rolls in. Smartphone manufacturers are climbing over each other to take full advantage of the rapidly expanding market opportunities in India. Chief among them is Chinese smartphone manufacturer, Xiaomi, which has just announced its first smartphone assembled in India, for the Indian market only. The Redmi 2 Prime still predominantly uses parts from China, but is assembled in Sri City. As for the device itself, the Redmi 2 Prime offers a considerable memory and storage upgrade on the regular Redmi 2 without costing a whole lot more. For just under 7,000 Rupees ($110 USD) you get a device packing 2GB RAM and 16GB storage, that’s double the memory and capacity of the Redmi 2 which costs just under 6,000 Rupees ($94 USD). Both devices make use of Qualcomm’s 64-bit Snapdragon 410 processor and host 4.7-inch IPS HD (1280×720) displays and an 8MP camera on the back. What’s more, they’re dual SIM and can cope with LTE speeds up to 150Mbps. Xiaomi plans to bring more of its manufacturing process to India, eventually producing more of its components and packaging within Indian borders. Hugo Barra, Xiaomi’s chief stated “this is like the typical chicken and egg story. Unless there is any smartphone manufacturing happening in the country, you cannot expect to get components locally.” So this is very much just the first step in its journey to cracking the Indian market. 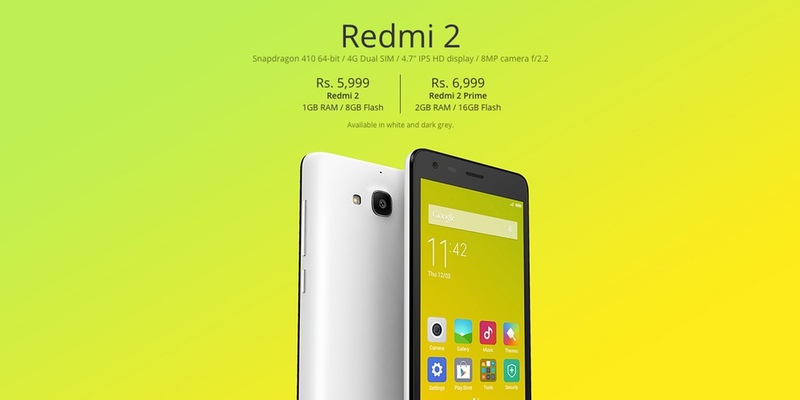 Indian consumers can purchase the new Redmi 2 Prime direct from mi.com from today. Consumer insights and research firm Kantar Worldpanel has released its smartphone sales data for the second quarter of 2015, which runs from April through June, and it’s a bit of a mixed bag for Android. Growth in the United States and China, but declines in Europe. Android also saw market consolidation stateside during the three month period. Let’s get the bad news out of the way. In the second quarter, Kantar says Android posted its “strongest year-on-year share drop in Germany” since the beginning of 2015. 81% of all smartphones sold in Germany during the same period last year were powered by Android, compared to 75% this year — other smartphone operating systems have seen gains in the country during the same period.